I don’t know about you but whenever I see the word ‘Chypre’ associated with a modern fragrance I tend to role my eyes in disbelief, Bottega Veneta is an exception to the rule, it does feel like a chypre. The first spray reveals a soft, sparkling note of bergamot which is coupled with the dreaded pink pepper, I have nothing against pink pepper it’s just that it is in EVERYTHING at the moment, but here it works and the overall effect is fuzzy and soft. There is also a touch of something mentholated in the opening that is slightly reminiscent of Vick’s Vapour Rub, that may sound awful but it slots in nicely next to the bergamot and pepper before fizzling out. As I mentioned before, Bottega Veneta is described as a ‘leathery floral chypre’ and the leather comes through quite quickly and to my nose the effect is closer to that of suede than leather. I enjoy suede in fragrance, it is impressive that not only can you smell the scent of suede, you can also smell its soft, luxurious texture, I particularly like the use of suede in Traversée du Bosphore by L’Artisan Parfumeur, a fragrance that I really should get around to reviewing at some point. Laying underneath the suede is a chypre base of patchouli and oak moss which, just like the rest of the fragrance, feels soft and understated. The patchouli is the main player during the base and dabs of iris, oak moss and a little musk very much feel like they are playing supporting roles. Bottega Veneta’s progression to the base is slow and languid and overall the fragrance doesn’t change much, there are just subtle movements that allow for some notes to bow out gracefully and others to come through and flourish. Bottega Veneta does an excellent job at evoking luxury leather goods, it’s impossible to take a whiff and not think of posh handbags, suede gloves and fancy things. I also think that it is a very well done fragrance, that unlike so many new fragrances that hold the ‘Chypre’ label, actually feels like one, and yes it is very pretty. All of that aside, I can’t help but think it’s just a little bit too bland for my tastes, it doesn’t have much oomph to it (nor should it, it is not a fragrance that would suit oomph) but that is more to do with me and my tastes than the fragrance itself. Sorry Bottega Veneta, it’s not you, it’s me. Bottega Veneta in scent and in bottle is understated, it is simple, luxurious and very much suits the brand’s aesthetic. The apothecary style bottle is adorned with a silver cap and a beige leather tie. The Pure Parfum is housed within Murano Glass and tied with a khaki coloured leather tie. Bottega Veneta is available in 30ml, 50ml and 100ml Eau de Parfum, prices range from £42-£75 and matching body products are also available. 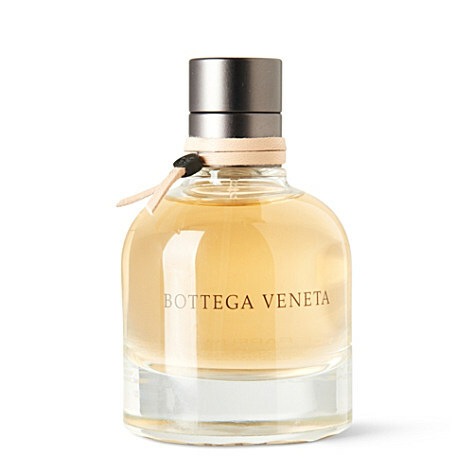 A pure parfum version of Bottega Veneta, housed within Murano Glass is also available, and 65ml will set you back £365. Posted in Bottega Veneta, Chypre, Feminine, Floral, Perfume Reviews and tagged 2011 Release, Bottega Veneta, Chypre, Floral, Leather. Bookmark the permalink. I’m with you on the pink pepper thing: I swear it’s THE note for 2011. It’s been in freakin’ everything. That said, I still want to try this, as I have many friends raving about it. You’re the first lukewarm review I’ve read, and we seem to have a pretty similar ‘fume aesthetic, so I wonder if I’d indeed like it. It’s a good perfume just not for me. ps. I totally agree about the pink pepper thing! I’m almost shocked when I don’t see it on a fragrance pyramid. Hi Stef, thanks for stopping by! If you like quite/polite-type scents like Balenciaga Paris and Infusion d’Iris then you will really like this one. I think it’s great scent, just not for me. Tommy, after reading this review, I have a hard time believing it’s not for you— you’ve made it sound absolutely divine! As in, unsniffed purchase “divine”…. Love the title of this post! Sometimes we can appreciate how good a perfume is even if it’s not really “us”. It’s not you but it’s definitely me! I’m very glad it’s you and I’m also glad that you managed to find it for a bargain price! It’s all about the Madonna gloves! Are the Bottega Veneta shops super-posh? Their general aesthetic leads me to believe that they are. “You captures”? I should be in bed really. Well, here I can at least completely agree with you. We are 100% in sync re the BottegaV. I too thought is just perfectly lovely, (and absolutely well suited to the label), but also thought it a little oomph-less for my personal tastes. Oh, and by the way, BV really reminded me strongly of some other fragrance I’ve sampled before. But for the life of me I can’t work out which one exactly (???) It just feels so very familiar. Any ideas anyone ??? The other fragrance it really reminds me of is Dior Homme, could it be that? For me, it’s a dead-one mimic of Gucci’s Rush–at least in the dry-down. Could that be it for you, too? Oh my goodness–“dead on,” not “dead one.” Geez. Is it lunch time yet? I’m sooo happy you wrote this review because I felt like an outcast with everybody around raving about this perfume and me thinking exactly “it’s just a little bit too bland for my tastes, it doesn’t have much oomph to it”. I think I might have worked out what BV was reminding me of. … On my skin, as I mentioned yesterday, the whole “plummy-rose-suede-patch-nilla” accord was giving me a very “candied-raspberry” like vibe. (Or at least, more “raspberry-ish” than actual “plum-my” to my nose). And I think it was this “raspberryness-joined-to-suede” that made me think BV reminiscent of a lighter Cuir Amethyst. (Which, of course, is an actual raspberry/leather). Good call. Michel Almirac is the perfumer who created both Cuir Amethyst and Bottega Veneta. He also created Bond #9’s West Side and Jette Joop By Night – and these two are pretty identical to my nose. Not much more to add really, spot on review! I got a nice opening with a “cool leather” vibe but it stayed too close to my skin and was a little understated for my in your face taste. I think we’re definitely on the same page with this one, we tend to go for the more ‘in your face’ scents so BV was never going to be a great love. I just tried a sample, and I agree. It’s well-orchestrated; I just prefer brasher scents. I would say yes – it’s the perfect ‘leather goods’ scent.